“Then my reports have all been wasted!” — My voice trembled as I recalled the pains and the pride with which I had composed them. All my unspoken instincts, my vague suspicions, suddenly took shape and centred upon the naturalist. In that impassive colourless man, with his straw hat and his butterfly-net, I seemed to see something terrible — a creature of infinite patience and craft, with a smiling face and a murderous heart. “Why, then we may find the lady of service. It must be our first duty to see her — both of us — tomorrow. Don’t you think, Watson, that you are away from your charge rather long? Your place should be at Baskerville Hall.” The last red streaks had faded away in the west and night had settled upon the moor. A few faint stars were gleaming in a violet sky. A terrible scream — a prolonged yell of horror and anguish burst out of the silence of the moor. That frightful cry turned the blood to ice in my veins. “Oh, my God!” I gasped. “What is it? What does it mean?” Holmes had sprung to his feet, and I saw his dark, athletic outline at the door of the hut, his shoulders stooping, his head thrust forward, his face peering into the darkness. He had started running swiftly over the moor, and I had followed at his heels. But now from somewhere among the broken ground immediately in front of us there came one last despairing yell, and then a dull, heavy thud. We halted and listened. Not another sound broke the heavy silence of the windless night. I saw Holmes put his hand to his forehead like a man distracted. He stamped his feet upon the ground. A low moan had fallen upon our ears. There it was again upon our left! On that side a ridge of rocks ended in a sheer cliff which overlooked a stone-strewn slope. On its jagged face was spread-eagled some dark, irregular object. As we ran towards it the vague outline hardened into a definite shape. It was a prostrate man face downward upon the ground, the head doubled under him at a horrible angle, the shoulders rounded and the body hunched together as if in the act of throwing a somersault. So grotesque was the attitude that I could not for the instant realize that that moan had been the passing of his soul. Not a whisper, not a rustle, rose now from the dark figure over which we stooped. Holmes laid his hand upon him and held it up again with an exclamation of horror. The gleam of the match which he struck shone upon his clotted fingers and upon the ghastly pool which widened slowly from the crushed skull of the victim. 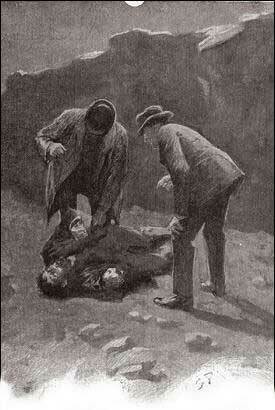 And it shone upon something else which turned our hearts sick and faint within us — the body of Sir Henry Baskerville! There was no chance of either of us forgetting that peculiar ruddy tweed suit — the very one which he had worn on the first morning that we had seen him in Baker Street. We caught the one clear glimpse of it, and then the match flickered and went out, even as the hope had gone out of our souls. Holmes groaned, and his face glimmered white through the darkness. With feverish haste we had turned the body over, and that dripping beard was pointing up to the cold, clear moon. There could be no doubt about the beetling forehead, the sunken animal eyes. It was indeed the same face which had glared upon me in the light of the candle from over the rock — the face of Selden, the criminal. Then in an instant it was all clear to me. I remembered how the baronet had told me that he had handed his old wardrobe to Barrymore. Barrymore had passed it on in order to help Selden in his escape. Boots, shirt, cap — it was all Sir Henry’s. The tragedy was still black enough, but this man had at least deserved death by the laws of his country. I told Holmes how the matter stood, my heart bubbling over with thankfulness and joy. “Why, Dr. Watson, that’s not you, is it? You are the last man that I should have expected to see out on the moor at this time of night. But, dear me, what’s this? Somebody hurt? Not — don’t tell me that it is our friend Sir Henry!” He hurried past me and stooped over the dead man. I heard a sharp intake of his breath and the cigar fell from his fingers. “Who — who’s this?” he stammered. “It is Selden, the man who escaped from Princetown.” Stapleton turned a ghastly face upon us, but by a supreme effort he had overcome his amazement and his disappointment. He looked sharply from Holmes to me. My friend bowed his compliments. “You are quick at identification,” said he.